When the Zoom F8 first appeared it looked like a winner and I made it my find of the week in podcast 208. I kept my eye on it but had a niggle that stopped me buying it for a while, but in undertaking further research, the turning point for me was a number of people whom I trust were making very complimentary comparisons between the Zoom F8 and Sound Devices units. So I took the plunge and bought an F8. I use it for a variety of work including location recording work for radio drama and documentaries as well as corporate conference recordings where the Zoom F-Control comes into its own. It comes with a camera mounting bracket, 2 TA3 mini XLR to XLR cables for the main outputs should you need to feed something else with the mixer output from the F8, an A mains ‘wall-wart’ style of AC adapter, a manual, and free download codes for Wavelab LE and Cubase LE. On the left-hand side there are 4 combo XLR sockets with the line inputs on the jack sockets. There is also a usb socket, external power in and two SD card slots. More on these later. On the right-hand side, there are the other 4 inputs, again on combi XLRs, two TA3 mini XLRs for the stereo output, a 1/4” headphone socket and a stereo Sub output on a mini-jack socket. It is good to see that even in these days of file based recording that Zoom has included audio outputs, but wisely in my view, used smaller connectors so as not to waste valuable panel space on connectors that won’t be used that often. The USB port is used for a variety of applications like firmware updates, file transfers, connection to the F-Control remote controller, as well as enabling the F8 to be an 8-in/4-out USB audio interface operating at sample rates up to 96 kHz. Moving round the back we have the battery compartment, the external power in for the AC adapter and timecode in and out on BNCs. I have to say that I haven’t used the timecode features in anger because most of my work is radio related, but I knew that I wanted to have a timecode capable machine and the F8’s time code has a Temperature Compensated Crystal Oscillator (TCXO) that the spec claims generates time code at 0.2 ppm accuracy. The F8 supports all standard drop-frame and non-drop formats and can jam sync to time code being provided by external devices. An input and output are provided on standard BNC connectors, enabling easy integration into any rig. Finally, there is a socket to enable you to plug in one of Zoom’s mic modules. On the front panel is a bright and clear 2.4 inch colour backlit LCD, with has adjustable brightness, which can be set to monochrome, if you prefer. To the right of the display are the slate/tone switch, multi-function control, Menu button and headphone volume control. Then we have the mixer section for the 8 tracks with a gain control, pre-fade-listen switch and record enable switch all of which are very easy to use. Finally the all important Transport controls. Unlike some other budget field recorders including the Zoom models I have owned, like the H2 and H6, this isn’t made of plastic, it is metal all over, which again breeds confidence in its robustness. When I am in location mode, the F8 stays in my ‘electric handbag’ along with 3 channels of Sennheiser G2 radio mic receivers, for which I have matching belt pack and stub transmitters so I don’t end up tied down with mic cables on location. I do use a cable to my Audio Technica stereo shotgun mic but that is usually with me. The complete rig does mean I am not tethered to anyone or anything else, which is brilliant especially when I am in run-and-gun mode on fast moving radio documentaries. I have backup radio mics on the key players which mean I can cover the action with my shotgun but know that if a key player goes too far afield I still have them on a radio mic, all tracked up separately as well as a stereo mix for speedy producer approval. Having 2 SD slots means you can be recording onto two cards simultaneously and there is a good selection of options about what goes to which card. I tend to have it configured so the individual tracks are recorded onto one card and the stereo mix is routed to the second card so that if one card fails, I am still in with a very good chance of having a recording of the event. If you only need 4 mic channels, then there is a dual channel recording mode where you can record a second set of backup tracks at a lower record level to give you, even more, protection and redundancy. The F8 saves the files periodically during recording. This provides an extra level of protection in the event of unexpected file interruption, for example, due to power loss or the removal of an SD card and there is a pre-record function allowing you to capture up to 6 seconds of audio before you hit the RECORD button. There are 3 three power sources. A 4-pin Hirose connector on the left-hand side for external 9-16 volt DC powering of the F8. Internal power is provided by 8 AA batteries on the back panel and the F8 can even switch power sources from external DC power to the AA batteries at a user-defined voltage level for uninterrupted recording. You can also use the supplied 12 volt AC adapter when not on the go. I use the Sanyo Eneloop 2 amp hour rechargeable AA batteries. I carry 2 sets in my handbag as well as a 3rd set in fast chargers in the car to recharge these batteries in around 20 minutes. Finally, for belt and braces, I have a couple of packs of alkaline AA batteries, in the handbag just in case. The Zoom F8 has Bluetooth and there is an F8 iOS Control app that you can use on an iPhone, iPad, or iPod Touch (5th Gen) using Bluetooth LE protocol. Functions include Record, Play, Stop, Fast-Forward, and Rewind, plus mixer pan and fader level. You can also monitor input levels, current time code, and battery status. With Zoom F8 Control app you can also rename files, enter metadata, and set date/time information directly from your iOS device. 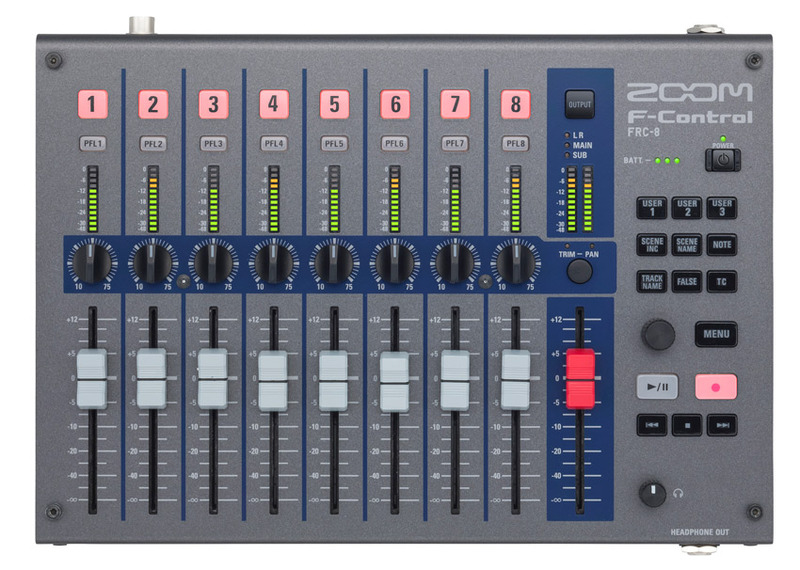 If you not in a run-and-gun mode then Zoom also has an F-Control hardware controller that you can connect to the F8 or F4 and control and mix the F8 or F4 and this is ideal for me when I am in conference recording mode. At first, I couldn’t get the F-Control to work with my Zoom F8 but a brief look at the video on the Zoom site made it clear that I didn’t have the latest firmware. I downloaded the latest version of the firmware v3.20 and then followed the instruction in the F8 manual to transfer the firmware update file onto an SD card and then to power up the F8 whilst holding down the Play button. It warned me that the battery power was too low, and wouldn't proceed with the firmware update, a nice feature because an incomplete firmware update could 'brick' my lovely Zoom F8. I dug out the AC adaptor and then all then went well. With the new firmware, I was then able to access the F-Control option in the USB menu on the F8 and enable the F-Control mode. Immediately the F-Control lit up and I was able to control my F8 from the F Control. On the top panel, there are nine 60 mm faders (eight tracks plus the Master) and controls for trim, pan, and track arming. You can monitor channel and output levels with 12-segment LED meters, and there are 3 user-programmable buttons and a dedicated timecode button. Other dedicated buttons include Track Name, False (take) Scene Inc(rement), Scene Name, and Note. Then there is the multi-purpose function control, with associated Menu button, a set of Transport controls and finally the headphone volume control. On the back, there are two USB sockets one for the included lead to connect with your F4 or F8, and a second to connect a USB keyboard. There is a 4-pin HIROSE connector for external 9 - 16v DC power and a 1/4” jack socket for the headphone lead from the F4 or F8. I love the fact that I now have faders and so can easily control the mix using the faders whilst leaving the channel trim controls to set the record levels of the individual tracks. Having the gain trim controls on the F-Control as well as the faders and the function control is so helpful when working in conference record mode. Note that not all keyboards work. Apparently, if your keyboard has a USB hub in it then it doesn't work. I tried a conventional Apple keyboard, which has an internal hub, and sure enough, the F8 ignored it. When I tried my Logickeyboard backlit keyboard, which has two USB cables, one for the keyboard and a separate one for the hub, the keyboard part worked fine, so it would appear that keyboards with built in hubs don't work with the F-Control and F8. There is an option to extend the headphone output from the F8 through to the F-Control and the F-Control even comes with a stereo jack plug lead to make this as easy as possible. F-Control has two main power options: four AA batteries for up to 9 hours of operation, or power it with a 4-pin HIROSE connector with an external battery pack. An additional USB bus power option is available when using the F-Control with an F4 but unfortunately for me, it's not available with the F8. So what do I think? I have owned my Zoom F8 for 18 months now and it hasn't given me any trouble. For me it is the perfect combination of price, build quality and features, especially as I don't earn my living full time from location recording, that style of work forms part of my portfolio of services. That said, when I am undertaking location recording, I cannot afford to be let down by cheap equipment and the Zoom F8 has never let me down. Moving onto the F-Control, this was sent to me to review as an existing Zoom F8 owner and it won't be going back. For corporate conference work, it makes the F8 even more useful. In the past, I have used mic splitter to feed the F8 and a small mixer for a PA mix. With this, I could consider using the F8 and F-Control combo to do it all. Here in the UK when I bought my Zoom F8, 18 months ago, it was £792 including UK VAT at 20% from Pink Noise Systems Ltd. Looking on their web site, it is now £979 inc VAT. The F-Control from Pink Noise is priced at £299 inc VAT. In the US a typical price for the Zoom F8 is $999 and $349 for the F-Control.